With its central location, Discovery Suites Hotel is within easy reach of most tourist attractions and business addresses in Manila. All 220 rooms at The Discovery Suites Hotel have all the modern facilities guests' would expect from a hotel of this class. 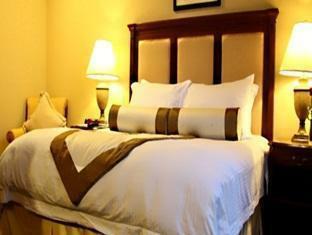 Each guestroom has non smoking rooms, air conditioning, bathrobes, daily newspaper, desk, hair dryer, ironing board. This Manila accommodation contains all of the facilities and conveniences you would expect from a hotel in its class. The Discovery Suites Hotel offers massage, indoor pool, kids club, gym, sauna, steamroom, spa to provide extra pleasure and relaxation for all guests. Being one of the good quality hotels in Manila, guests staying at this hotel will find its convenient location and tranquil atmosphere pleasurable. To make your reservation at the Discovery Suites Hotel quick and easy, please select your preferred dates of stay and proceed with our secure online reservation form.